Low-impact aerobic exercise is one of the safest ways for those with chronic back problems to lose weight. Benefits of aerobic exercise are multiple: dropping pounds helps alleviate the stress excess weight places on your back, and increased circulation promotes disc healing and relieves stress, which can cause tight back muscles. 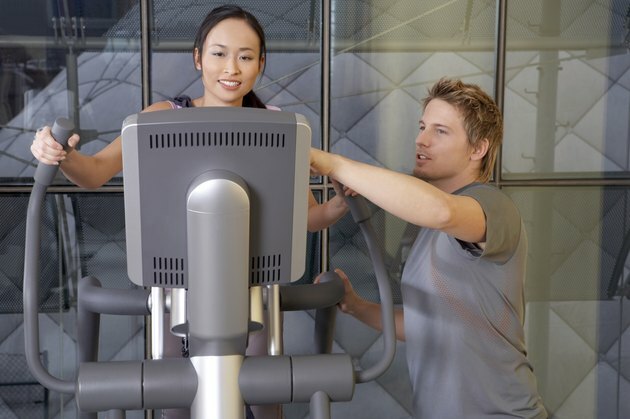 A number of cardio machines offer appropriate low-impact, calorie-burning workouts, so you can lose extra weight with little to no risk of injury. Consult your health-care provider for exercise recommendations specific to your situation. The elliptical trainer offers a no-impact workout. It has suspended, individual foot platforms that move in smooth, continuous strides, gliding forward and back. Your feet don’t leave the platforms as you make each stride, which eliminates the small risk of jolting presented by walking. Without placing stress on your back, you can safely increase the speed of your stride on an elliptical trainer to burn more calories. Most elliptical machines have handles you can push and pull in rhythm with your lower-body movement for increased calorie burning and upper-body toning. Using the handles causes a slight twisting motion through your trunk, so ask your doctor which type of elliptical is best for you. While any walking is generally considered good exercise for both weight loss and back pain rehabilitation, the treadmill provides the least amount of impact. Its belt propels your feet forward with each step, which is one reason treadmill workouts are slightly, but negligibly, easier than walking outside. Until you've lost some initial weight and developed a sense of control on the treadmill, keep your pace moderate to moderately challenging, rather than vigorous. No matter how much weight you’ve lost or how good your back feels, you should never have to hold on to the treadmill while you’re walking. Doing so could restrict your torso’s natural movement, leading to potential re-injury. Stationary exercise bikes come in a variety of forms, and it’s likely that one suits your back issues and personal preferences more than another. All exercise bikes are conducive to weight loss, because cycling can be a high-calorie burning workout. Traditional stationary bikes have wide, supportive seats and are belt-driven. Recumbent bikes have full seats, including backrests. Rather than extending your feet to the pedals, extend your legs forward. You might begin on a recumbent bike, move to an upright bike and wind up taking indoor cycling classes as you lose weight and your back improves. The step machine is similar to the elliptical trainer in that it has individual foot platforms, or pedals, that you pump up and down without lifting your feet. A step treadmill is different from a step machine in that it’s a series of revolving stairs that you climb for the duration of your workout. Both machines offer low-impact, calorie-burning workouts, but the step machine is a lower impact exercise than the step treadmill. Rather than holding on, lightly rest your hands on the machine, which helps prevent you from keeping your upper body too rigid and reducing the effectiveness of your overall workout. Is Walking on a Treadmill Bad for Your Back?